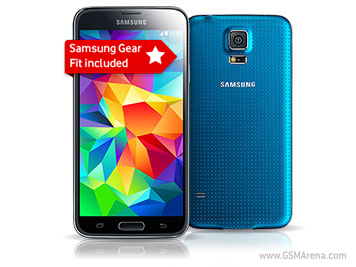 If you buy a Samsung Galaxy S5 from Vodafone UK until June 26, you’ll receive a free Gear Fit smartband. This is essentially a £149 bonus, as that’s how much the Gear Fit currently goes for on its own. The offer is valid only if you purchase the Galaxy S5 from Vodafone’s website, but you can take advantage of it regardless of which 3G or 4G plan you choose. The cheapest 3G contract that nets you the handset for nothing upfront will run you £42 per month, and it includes unlimited minutes, unlimited texts, and 2GB of data. For £5 more paid each month, you’ll get 4GB of traffic. If you pick a 4G plan you can get Sky Sports Mobile TV or Spotify Premium free for two years. For this to work you need to select a 24-month option that costs at least £47 per month, and doing that means you won’t pay anything for the phone upfront either. That £47 will bring you unlimited minutes and texts along with 5GB of data.